There is a great lunch place in town called Local Foods that offers inventive sandwiches made from locally sourced ingredients. A good friend of mine whom I often meet for lunch there orders the truffled egg salad sandwich every time we go. I have to admit I have never ordered it. But the last time we were there, he insisted I taste it. One bite and I realized I had been missing out. 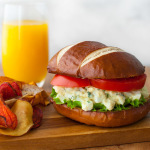 Who knew truffle oil could make such a difference in a basic egg salad – my egg salad sandwiches will never be the same. So, I have a funny story to share about the sandwich photo in this post. I can laugh about it now but when it happened it didn’t feel nearly as amusing. Like most food bloggers, I work at home and set up my “studio” wherever I can get the best light. It is not always the ideal situation but it works (most of the time). My usual set up is a card table on which I lay various boards to create the look of interesting tabletops and walls. On this particular day, I was using a marble pastry board as the backdrop and had the board leaning against a stack of books for support. In retrospect, I should have also attached some clamps to the bottom of the board to help it stay upright. You see where this story is going, don’t you? Now, imagine me accidentally bumping the table just enough to send the board tipping over. The board, of course, hit the glass and sent orange juice spraying EVERYWHERE. Me, camera, tripod, window, floor, light diffuser (aka old sheet) … pretty much everything in the general area got hit with juice. Remarkably, the glass didn’t break. Not having to worry about small shards of glass on top of the sticky mess was a small consolation. Given that I generally use glasses of water in my photos, I kept thinking “Why juice? Why did it have to be juice?” as I was cleaning everything up. Oh, how I wished I had put water in the glass … and secured the board better … and not hit the table. I am sure I will still be trying to get orange juice out of all the nooks and crannies of my tripod for the next several months. At least the sandwich was spared. Ruining a creamy egg salad laced with truffle oil and fresh tarragon on a perfectly buttered and toasted pretzel bun would have been a real tragedy. To hard-boil the eggs, place them in a saucepan just large enough to hold them. Add cold water to cover by 1 inch and bring to a boil over high heat. Remove the pan from the heat and cover. Let stand for 15 minutes. Drain the eggs, then transfer to a bowl of cold water and let cool until you are able to peel them. Peel the eggs and chop them into a medium dice. Place the eggs in a medium bowl. Add the mayo, truffle oil, tarragon, salt and pepper. Mix gently until evenly combined. Set aside. Butter the cut side of the rolls. Toast the rolls until lightly browned. Place lettuce on the bottom half of each roll. Then top with egg salad, equally dividing the egg salad between the two rolls. Add tomato slices and shaved parmesan, if using. Top with other half of roll and serve. Local Foods also adds shredded Parmesan to their egg salad. I think that along with the truffle oil adds to its uniqueness. I agree – love the parmesan on top. Makes me want to go to Local Foods for lunch today.